A magnitude-8.7 earthquake struck near the coastline of northern Sumatra at 11:09 p.m. local time on Monday. Indonesia's National Coordinating Agency for Disaster Management and Refugees has so far put the official death toll at 330, according to CNN, with Nias Island and Simeulue Island hardest hit. Indonesia's vice president has predicted that as many as 2,000 people may be dead (see Los Angeles Times story). The epicenter of the earthquake was close to the site of last Decembers destructive earthquake, which set off a devastating tsunami across the Indian Ocean that resulted in the deaths of nearly 300,000 people. 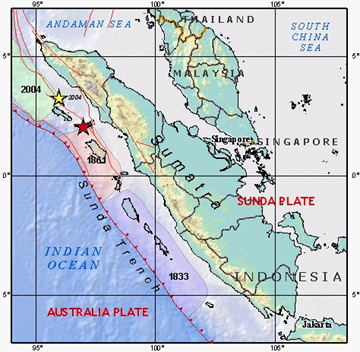 USGS published this preliminary map of the location of Monday's earthquake in Sumatra, which was followed by smaller earthquakes to the southeast. The magnitude-8.7 mainshock (the largest square) occurred not far from last December's magnitude-9.3 event (see map below). Courtesy of USGS. No tsunami was triggered by the earthquake, but the possibility of a tsunami resulted in the evacuation of coastal areas for higher ground in Thailand and elsewhere. NOAA's Pacific Tsunami Warning system issued a bulletin warning that the earthquake "has the potential to generate a widely destructive tsunami" nearby and that "authorities in those regions should be aware of this possibility and take immediate action." The bulletin suggested evacuation of coastlines that are within 1,000 kilometers of the earthquake's epicenter, and suggests monitoring for sites farther away. The region currently has no tsunami monitoring system in place. David Applegate, head of the USGS Earthquake and Geologic Hazards group, says that "the rupture appears to have taken place on the Sunda trench," which is one of the zones that researchers had determined had increased stress due to the Dec. 26th event. Seismologists published earthquake risk estimates for the region in the March 17 Nature, saying that a large earthquake was likely (see "Sumatra seismic risk"). "I should hasten to add, however, that the paper did not predict the earthquake in the sense of specifying a time window," Applegate says. "Rather, it suggested increased likelihood of an event." The Sunda fault is part of the subduction fault system that ruptured last year, and today's earthquake had the same kind of fault movement as last year's event. The epicenters are 179 kilometers apart, according to Paul Earle of USGS, with today's earthquake occurring to the south (see map at left). He says that this section of the fault zone last experienced a large earthquake in 1861, which triggered a tsunami that hit Sumatra. The December 26th earthquake is labeled with a yellow star, and Monday's earthquake with a red one. The pastel-colored zones show sections of the fault that ruptured in previous events. Courtesy of USGS. Yesterday's event is "not nearly the earthquake that the December one was," which has recently been estimated to magnitude-9.3, says John Vidale, a seismologist at the University of California at Los Angeles. The December event was at least three to four times larger, he says, so that even though the ground may have moved in the same way (along a thrust fault that could push ocean water), it didn't move as much, most likely. "As far as I know, we only know where this earthquake started," Vidale says. "It's hard to know the extent of the rupture," though it is probably big. And with regard to the recent work that calculated stress in the region, the fault the researchers said was the "most stressed is the one that broke," he said. Magnitude-6.0 and magnitude-6.7 earthquakes also struck just southeast of the 8.7 event, within hours, according to USGS.